Victoria Falls is one of the world’s greatest natural spectacles. 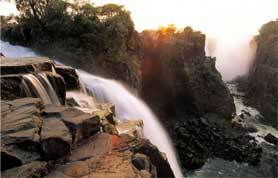 Declared a World Heritage Site, the Falls are a place of legend, romance and myth. Long before the Dr David Livingstone “discovered” them on November 16, 1855, the local Batonga people had named them Mosi-Oa-Tunya, “the smoke that thunders”. Activities include bungi jumping off the railway bridge, white water rafting through the Batoka Gorge downstream of the Falls (said to be the world’s most exciting stretch of rafting), body boarding the huge standing waves set up as the river bounces off underwater boulders, or floating above the Falls in a tandem microlight. Sundowner cruises on the broad sweep of Zambezi River upstream of the Falls are an exquisite way to experience an African sunset, while the more energetic can hire canoes for gentle, guided paddling trips. A network of trails leads through the rainforest surrounding the smoke that thunders. When the river is at its lowest, as little as 20 000m³ flows over the lip of the Falls per minute into the Devil’s Cataract, but when the mighty Zambezi is raging in April and May, this can be as much as 500 000m³. Livingstone town, former capital of Zambia, was named after the famous Scottish explorer, Dr David Livingstone. The town has much to interest the visitor, including the Livingstone Museum, which houses many of the explorer’s possessions and journals, and the Railway Museum, with a rich history of steam trains and railway memorabilia. A few kilometres upstream of the falls is the Mosi-Oa-Tunya National Park which runs along a strip of riverine forest. Although the park is only 66km² it provides a home for numerous antelope species, zebra, giraffe and white rhinoceros. Zambia is a thrilling destination with off-the-beaten-track charm: its highlights are the splendid Victoria Falls and Lake Kariba, as well as vast tracts of unspoiled wilderness and plains filled with wildlife. Zambia is oftern overshadowed by its nabour, Zimbabwe, because it shares two of the main regional attractions - the Victoria Falls and Lake Kariba. But Zambia is a thrilling destination in its own right, with an abundance of animal life and many beautiful attractions. Of particular appeal are Zambia's vast tracts of unspoilt wilderness and plains filled with wildlife. 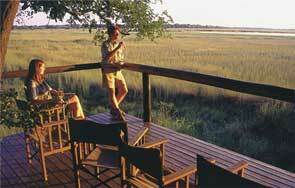 On the banks and islands of the Zambezi River there are several river lodges that offer safari experiences. You will be met at the Johannesburg International Airport by our representative and transferred by private shuttle to the Airport Holiday Inn hotel for check in and overnight. This day is set free of any activities to allow you to unwind from the long flight to Africa and get some good rest prior to the commencement of your Wildlife safari. Check out after breakfast, in time for private transfer to Johannesburg International airport, in time for connecting flight out to Zambia. Upon arrival in Livingstone Airport you will be met and transferred by scheduled road transfer to the Zambezi Sun Hotel for check-in. In the afternoon, a 15-minute helicopter flight of the Victoria Falls from the Zambian Side will give you an ‘Angel’s eye view’ of the magnificent Victoria Falls. Morning Tour of the Victoria Falls with a professional guide. Afternoon at Leisure. The Zambia Sun reflects the richness and diversity of the land's heritage. The architecture was inspired by the timeless African tradition, and its unique styling will offer visitors the experience of truly being at the heart of Africa. The hotel has the feel of a walled city, centuries old. It is comprised of open, organic buildings in earthy colours with rambling clusters of rooms, punctuated by chimneys and towers. The 212 guest rooms are low-slung, open and airy. Each one spills out onto a cool landscaped pool area, while the restaurant and bar are focused around the central pool. The two-storey en-suite rooms have private balconies that welcome the morning sun. Outside, the earth colours are soothing and soft. Inside, the airy rooms are alive with ethnic reds, blues and oranges. 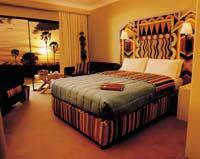 Added amenities in the rooms include independent air-conditioning, satellite TV, foldout couches, safe and telephone. The central reception area houses a family-friendly, high quality buffet restaurant, a pool bar and a lively alfresco grill and entertainment area. The Zambezi Sun is a place that captures the soul of Africa: simple, rustic, fun and welcoming. It's a place where friends and family can relax and enjoy Africa's greatest natural wonder in true African style. Check out and transfer by scheduled road transfer from the Zambezi Sun Hotel to Kasane Airport where you will be met by our representative who will assist you onto your scheduled charter flight to Savute Safari Lodge. Savute pulses to a timeless rhythm, a melody of mysterious wet and dry cycles that moulds its landscape and determines its inhabitants. A winding fossil channel vanishes into the sweeping expanse of a relic marsh, where the spectacular fortress of the Gubatsa Hills relieves Savute’s otherwise flat countryside. Savute Safari Lodge peers out from ancient acacia trees on the edge of the channel. Twelve twin-bedded thatched safari suites crafted from timber and glass with overhead fan, en-suite facilities and private viewing platforms offer luxury and comfort without detracting from your wilderness experience. The cocktail bar beckons you with a cold drink on a hot Savute day, while a fireplace turns the lounge into a cozy refuge on winter nights. During the summer months a dip in the plunge pool offers welcome respite from the midday sun. Game drives, conducted by a professional guide, in an open vehicle, provide the chance of seeing the numerous wild life species that the area is justly famous for. Thousands of zebra visit Savute en route to the new grasses at Mababe in the south, and return around February on their way home to Linyanti. They share the marsh with tsessebe, wildebeest, giraffe and cheetah. The rains also welcome thousands of migrant birds that swell Savute’s existing 300 species. At the end of the day admire the sunset from the lodges upstairs viewing deck and watch wild dogs hunt in the channel. After dinner served in the thatched area overlooking the channel, retire to your safari suite and let the gentle scops owl and the faraway roar of lions lull you to sleep. Scheduled Game viewing activities in 4WD vehicles. You will be transferred by scheduled charter flight from Savute Safari Lodge to Camp Moremi. Situated in the heart of the Moremi Wildlife Reserve  reputedly one of the most beautiful in Africa  Camp Moremi offers a diversity of habitat and animal life. There are possible sightings of cheetah, leopard, lion, elephant and buffalo on game drives, which are led by resident naturalist guides who are carefully trained to share their knowledge and deep love of Botswana’s wilderness with you. The famous elevated Moremi Tree lodge is the stunning focal point of this camp and houses the luxurious main lounge, a wildlife reference library, dining room and cocktail bar, shaded by giant ebony trees and overlooking the Okavango Delta’s Xakanaxa Lagoon. Camp Moremi accommodates only 22 guests in beautifully furnished East African style tents on raised teak platforms, each with private adjacent facilities. Other lodge facilities include a sundeck, plunge pool, covered boma (where breakfast and brunch are generally served), and an elevated game viewing platform at the water’s edge, affording magnificent views over the lagoon  the perfect spot for sundowners after the day’s game viewing and activities. You will be transferred by scheduled charter flight from Camp Moremi to Sandibe Safari Lodge. Sandibe Safari Lodge is located just south of Chief’s Island in one of the most beautiful regions of the Delta, near the ever-flowing Santandabie Channel. Sandibe’s site was specifically chosen for its extraordinary beauty, its prime location on the permanent Delta and its proximity to the game rich grassy plains. The lodge is situated under ancient riverine forest in deep shade overlooking a permanent papyrus waterway. The public areas [lounge & dining room] face into the sunset with three cottages to the north and five cottages to the south. All the cottages are spaced about 40m apart in order to afford maximum privacy whilst still being within safe walking distance from the public areas. The predominant theme of Sandibe’s décor is natural, earthy, organic and living. The eight African inspired cottages have their own private elevated viewing deck, en-suite facilities with twin basins, toilet and open air shower. There is an overhead fan and gauze covered glassless windows. Sandibe Safari Lodge has exclusive access to some 270 sq km comprising six broad ecotypes and associated bird, plant and animal species. Activities include daily game drives, bush walks, river cruises, mokoro excursions, bird watching, and stargazing. For relaxation there is a hammock, which sways in the trees outside the main living area, and a shaded plunge pool. You will be transferred by scheduled charter flight from Sandibe Safari Lodge to Maun Airport to connect to your flight to Johannesburg. Upon arrival in Johannesburg, meet our representative and transfer to the Airport Holiday Inn hotel for overnight. Morning city tour of Johannesburg. Tour the ‘City of Gold’  South Africa's main financial centre  with all its contrasts: From a building in the shape of a diamond and the modern Stock Exchange, to a muti shop for traditional healers and the Market Theatre Complex. Proceed through historic Parktown, making our way via up market Rosebank to Sandton, where Africa's most expensive commercial real estate is to be found. In the afternoon transfer to the Johannesburg International Airport to board your flight out to USA. Day 15: Arrive in San Diego with fresh memories of the rainbows at Victoria Falls and the Africa you’ve left behind, etched in your mind forever.